The man who fatally shot Hadiya Pendleton, 15-year-old girl whose death became a symbol of the rampant gun violence plaguing Chicago, was sentenced Monday to 84 years in prison. The convicted gunman, Micheail Ward, did not receive a life sentence as Hadiya's mother, Cleopatra Cowley had asked the court, but he will likely spend the rest of his life in prison for killing the girl and injuring two other people. Ward is 24 years old. Ward and Kenneth Williams, who was the getaway driver in the shooting, were both convicted of first-degree murder and two counts of aggravated battery in August. The men were tried together but had separate juries due to differing defense strategies. Despite a video-taped confession after his arrest weeks after the shooting in 2013, Ward maintained his innocence throughout the trial and the sentencing hearing. 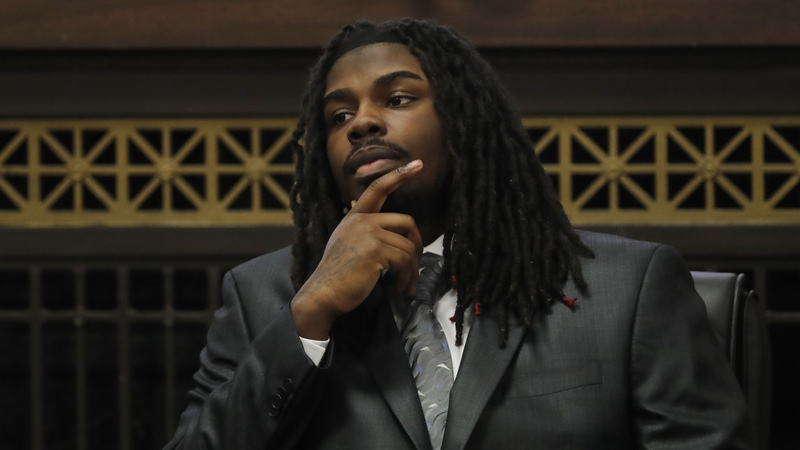 "Why am I the only person sitting here being found guilty for something I know for a fact I didn't do?" Ward asked the court on Monday, NPR member station WBEZ reported. "I didn't like anything about this case," he continued. "I didn't like that y'all found me guilty for something you said I did." His lawyers have argued that detectives manipulated Ward into making a false statement during a daylong interrogation nearly six years ago. The South Side teenager was shot to death on Jan. 29, 2013, while standing with friends in a small park about a mile from the home of then-President Barack Obama. Prosecutors argued Ward opened fire on the group of students mistaking them for members of a rival gang. A week before she was shot in the back, the honor student and drum majorette had performed at Obama's second inauguration. First lady Michelle Obama attended Hadiya's funeral. "I loathe Michaeil and his very existence because every breath he gets to take is one breath more than my 15-year-old daughter was allowed to breathe," Cowley said, reading from a written statement in court, according to CNN. "Hadiya is serving a death sentence handed down by Michaeil Ward and the family is doing life as a result of her death," she added. The Chicago Tribune reported Ward plans to appeal the conviction. Williams still faces sentencing.